Collateral has been the new fashionable area of finance and capital markets research over the past few years. Collateral and its associated transactions have been blamed for all the ills of the crisis, from runs on banks’ short-term wholesale funding to a scarcity of safe assets preventing an appropriate recovery. Some financial journalists have jumped on the bandwagon: everything is now seen through a ‘collateral lens’. The words ‘assets’, and, to a lesser extent ‘liquidity’ and ‘money’ themselves, have lost their meaning: all are now being replaced by ‘collateral’, or used interchangeably, by people who don’t seem to understand the differences. A few researchers are the root cause. The work of Singh keeps referring to any sort of asset transfer between two parties as ‘collateral transfer’. This is wrong. Assets are assets. Securities are securities, a subset of assets. Collateral can be any type of assets, if designated and pledged as such to secure a lending or derivative transaction. Real estate, commodities and Treasuries can all be used as collateral. Money too. Unlike what Singh and his followers claim, a securities lender lends a security not a collateral. Whether or not this security is used as collateral in further transactions is an independent event. This unfortunate vocabulary problem has led to perverse ramifications: all liquid assets, or, as they often say, collateral, are now seen as new forms of money (see chart below, from this paper). 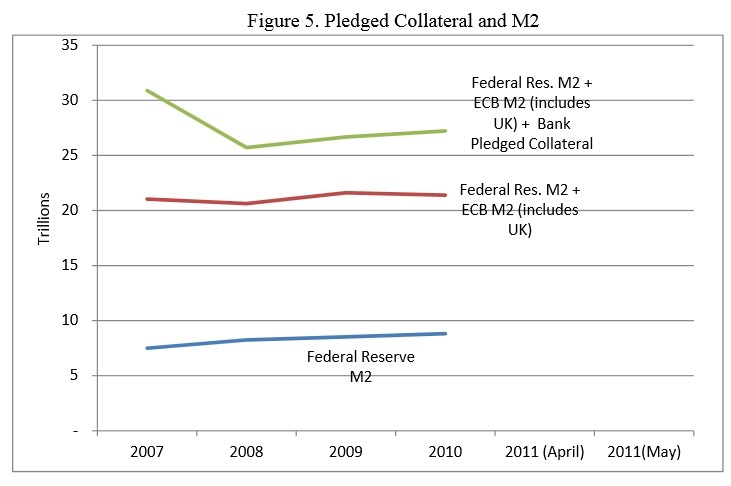 Specifically, collateral becomes “the money of the shadow banking system”. I believe this is incorrect. Collateral is used by shadow banks to get hold of money proper. Building on this line of reasoning, people like Pozsar assert that repo transactions are money… This makes even less sense. Repos simply are collateralised lending transactions. Nobody exchanges repos. The assets swapped through a repo (money and securities) could however be exchanged further. Depressingly, this view is taken increasingly seriously. As this recent post by Frances Coppola demonstrates, all assets seem now to be considered as money. This view is wrong in many ways, but I am ready to reconsider my position if ever Treasuries or RMBSs start being accepted as media of exchange at Walmart, or between Aston Martin and its suppliers. Others have completely misunderstood the differences between loan collateralisation and loan funding, which is at the heart of the issue: you don’t fund a loan, whether in the light or the dark side of the banking system, with collateral! The monetary base/high-powered money/cash/currency, is the only medium of settlement, the only asset that qualifies as a generally-accepted medium of exchange, store of value and unit of account (the traditional definition of money). There is one exception though. Some particular transactions involve, not a non-money asset for money swap, but non-money asset for another non-money asset swap. This is almost a barter-like transaction, which does occur from time to time in securities lending activities (the lender lends a security for a given maturity, and the borrower pledges another security as collateral). Nonetheless, the accounting (including haircuts and interest calculations) in such circumstances is still being made through the use of market prices defined in terms of the monetary base. Still, collateral seems to have some mysterious properties and Singh’s work offers some interesting insights into this peculiar world. The evolution of the collateral market might well have very deep effects on the economy. The facilitation of collateral use and rehypothecation, as well as the requirements to use them, either through specific regulatory and contractual frameworks, through the spread of new technology, new accounting rules or simply through the increased abundance of ‘safe assets’ (i.e. increased sovereign debt issuance), might well play a role in business cycles, via the interest rate channel. Indeed, by facilitating or requiring the use of increasingly abundant collateral, interest rates tend to fall. The concept of collateral velocity is in itself valuable: when velocity increases, interest rates tend to fall further as more transactions are executed on a secured basis. Still, are those transactions, and the resulting fall in interest rates, legitimate from an economic point of view? What are the possible effects on the generation of malinvestments? An example: let’s imagine that a legal framework clarification or modification, and/or regulatory change, increases the use and velocity of safe collateral (government debt). New technological improvements also facilitate the accounting, transfer, and controlling processes of collateral. This increases the demand for government debt, which depresses its yield. Motivated by lower yield, the government indeed issues more debt that flow through financial markets. As the newly-enabled average velocity of collateral increases substantially, more leveraged secured transactions take place and at lower interest rates. While banks still have exogenous limits to credit expansion (as the monetary base is controlled by the central bank), the price of credit (i.e. endogenous money creation) has therefore decreased as a result of a mere regulatory/legal/technological change. I have been wondering for a while whether or not such a change in the regulatory paradigm of collateral use could actually trigger an Austrian-type business cycle. I do not yet have an answer. Implications seem to be both economic and philosophical. What are the limits to property rights transfer? How would a fully laisse-faire market deal with collateral and react to such technological changes? Perhaps collateral has no real influence on business fluctuations after all. There is nevertheless merit in investigating further. I am likely to explore the collateral topic over the next few months. PS: I will be travelling in North America over the next 10 days, so might not update this blog much. But suppose that instead of a sterling bank account, a smartcard or a smartphone app enabled me to pay a bill in Euros directly from my holdings of UK gilts? This is not as unlikely as it sounds. It would actually be two transactions – a sale of gilts for sterling and a GBPEUR exchange. This pair of transactions in today’s liquid markets could be done instantaneously. I would in effect have paid for my meal with UK government debt. She fails to see that she would have paid for her mean with Sterling, not with government debt! Government debt must be converted into currency as it is not a medium of exchange/settlement. It is always valuable to source the origin of bad ideas. Certain types of collateral (those egligible for CB-repo) can be seen as close to money, BUT only for those economic actors (banks) that have access to the CB window: by lending money to the government they can ignore liquidity considerations for the most part. this is not true of shadow banks or fund managers who have no access to the CB. Of course, via second and third round effects (akin to the money multiplier) remoter sectors would be affected as well. In a free market system there would not be the privilege for some players to get interest (on a government bond) withoult incuring the cost of foresaking liquidity. Assets would be ranked by their liquidity and a long term government bond would be as liquid as, say, a fully collateralized mortgage with a good credit score. By not being able to rely on a CB, bankers would have to hold way higher cash reserves, certain transactions would not happen a.s.o. Yes, some assets are ‘close’ to being money due to their liquidity, some of which emanates from central bank policies, though not all. But they still need to be ‘converted’ into money to be of any use. Even banks, when they borrow from the CB by providing that sort of collateral, have to pay off the loan at some point. It looks to me that the boom in some of those products is due to a surplus liquidity in the economy. People have excess cash and want to place it in some liquid assets whose yield is higher than cash. The ABCT holds but I think it is time to investigate the ‘modern’ reasons behind it. Which are a lot more complex than the traditional version described by Mises and Hayek. Banking has changed a lot since then. In their time, banks mostly lent to businesses, and their description of the boom/bust fits that fact. Not the case anymore. Fully agree that Hayek’s analyis needs to be changed in order to be usable in the modern context..
but also in Hayek’s time there were different types of “money” a simple structure might look like that: international (gold), between banks (deposits) and cash (outside the banking system). In good times, there was not much difference in percieved value, in bad times, well…. Thanks for the clarifications! I was beginning to question my ability to understand some of these issues. They all seem to conclude with the need for states to expand deficit spending in order to provide more “safe collateral.” They seem to be totally unaware of the role of the Fed in creating an artificial demand for safe collateral. Also, this seems to be the natural conclusion of the circular flow model of the economy taught in intro to econ classes. It’s a ridiculously simplified model that mainstream economists take far too seriously. In the circular flow model, economies can grow only through increases in the money supply, which happens through credit expansion. Government debt then appears as the safest way to expand credit and provide safe collateral. Therefore, deficit spending and increasing government debt are seen as the only means for growth.